I guess it’s safe to say my blog is pretty much dead now since I haven’t updated it in almost 2.5 years. So what changed since then? Not much on the business front, and probably the most notable change in my personal life is that I’ve moved into a new house. At present I’m trying to kick off an affiliate project, I started in early January, lost some money initally but now it’s close to break-even. Still learning a lot about AdWords, QS, ad writing and keyword research, once I master those things I hope to achieve a nice ROI with this project. Busy days are ahead as I’ve got a lot of plans in my mind to get my business back up. Starting with DV Hardware you can expect a lot of reviews and I’m in the process of creating a Dutch version of DV Hardware, this new site will mainly be used for Dutch versions of DV Hardware’s reviews and occassionally some news that focusses on the Dutch and Flemish market. I’m using the Dutch version to experiment a bit with new layouts as DV Hardware is in desperate need of a more modern look. Additionally I also need a couple of reviewers so I can scale up the number of reviews posted at DV Hardware, but I’m putting this off a bit as it’s not easy to find honest people who meet my expectations, especially because I can’t offer a monetary form of compensation. New reviewers should be able to properly test products, take decent photographs and be capable of turning their thoughts into a decent article that highlights all the good and bad parts of the product. Getting some new private sponsors for DV Hardware is another major goal and I’m also going to try to get some completely new revenue streams to get my business back on track. I’ve got my eye on a couple of affiliate marketing opportunities that could become a major pillar of my company, it’s still early but I’m optimistic about the potential. Just looked at my blog and noticed my last post was in January. Guess I kinda lost the spirit to keep blogging and I don’t think I’ll pick it up anytime soon. Business-wise things have been pretty rough this year and I’m hoping to find some new ways to boost my revenue so I can keep doing what I enjoy. Currently, I’m working on a couple of reviews for DV Hardware. Soon I’ll have a review of a new product from Roccat and after that you can expect a review of BitFenix’s first case. I’m also planning to write a review of the latest Kindle, but this article is delayed because my device started malfunctioning. The first couple of days my Kindle crashed quite a lot and since one of these crashes the device is incapable of displaying anything except the navigation and plain text. PDF files and websites are no longer readable and book covers and other images are no longer fully rendered. Contacted Amazon’s customer services and after a couple of e-mails and a call they decided to send me a replacement. Hopefully it will arrive soon as the Kindle is an amazing device (as long as it works 100%). Most investment gurus would have you believe that you need to trade a lot and own a lot of securities to become wealthy. But is this really true? The analysts from Casey Research proof this is not the case, they give a clear example that one very well-informed investment decision per decade is all you need to retire with a small fortune. And we’re not talking about stock picking here, buying a stock like Microsoft (MSFT) at its IPO would have given you a 30,138% gain, but picking these kind of winners is really hard. The example from Casey isn’t about becoming lucky by buying winners but about having lots patience and identifying major economic trends early. The story starts in 1970 with the purchase of one troy ounce of gold for $35. 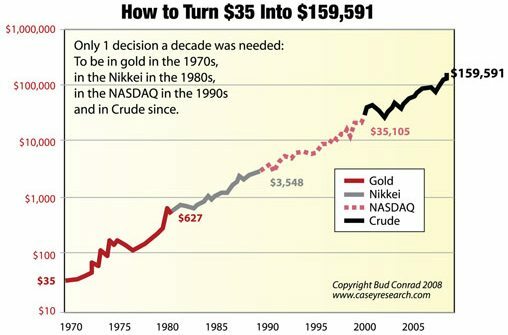 In January 1980 the price of gold hit a peak of around $850, but in this example the gold is sold at $627 and invested into the Japanese Nikkei index. One decade later it’s time for the next investment, the Nikkei went up more than fivefold and the initial capital of $35 was turned into $3,548. This money could then be invested in the NASDAQ and sold for a tenfold profit in 2000. Oil or gold were a good place to put the tech money into, an investment into oil would have given you close to $112,336 while an investment in gold would have quadrupled your investment to $134,081.